For Spa, we have a Locker Room, Shower Boothes, a Dry Sauna, a Jaccuzi and a Flower Bath. Those Spa use are also included in our original Spa Combination courses. Experience the ultimate luxury with reasonable prices. 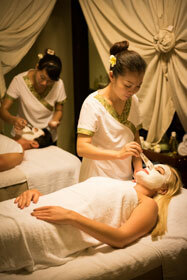 Chose your favorite Massage, Facial Treatment and Body Treatment from various courses. These combination courses includes the use of Spa facilities. Combination courses are reasonable and affordable. For our Spa Combination Course, you have all choices from above ①〜⑥ for your desired treatment.